Ever noticed a tweet disappear? As in someone else can't see something you posted? There's a common mistake even twitter pros make that causes this to occur. Are you sure you're seeing all of the replies to your tweets -- even from people you don't follow? Do you ever find yourself missing important posts -- like those from your real life friends? Do you know which will reach a wider audience: new style retweets vs old style retweets? This article will answer these and other twitter related questions. It will help beginner to intermediate twitter users get the most out of the service. These appear simple. 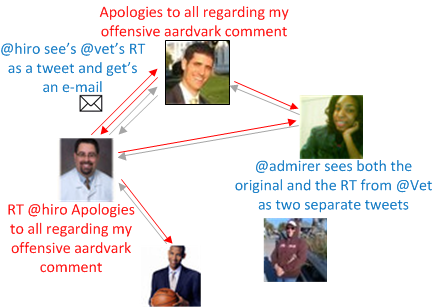 These show up in the timeline of your followers (@admirer and @vet in the example above). And they don't show up in the timeline of anyone who doesn't follow you (@effusive). If this was all there was to twitter it would be a complete waste of time. The subtlety with this type of tweet is that your content may show up to someone that doesn't follow you but that is following a hashtag or a topic you mention. 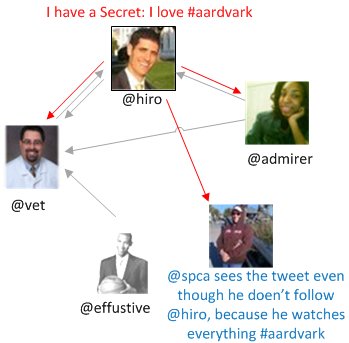 In the example above @hiro thows a hashtag onto the word aardvarks to indicate that it's special somehow. 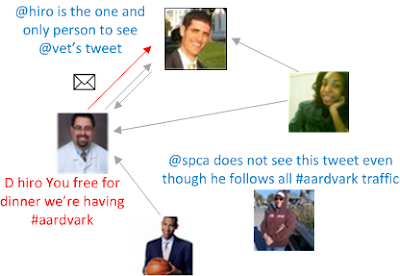 His tweet is then picked up by @spca who runs a constant search in a twitter client for the word "#aardvark". The first time I realized how powerful this could be I had was at a conference. I was extremely bored by a terrible keynote. With nothing else to do I discovered the conference hashtag on twitter and started watching it. Suddenly I realized I wasn't alone. I was in a huge room full of people making fun of the presenter! It was like telepathy, or group consciousness or something. I've never felt alone or bored at a conference since. Replies are more complicated. 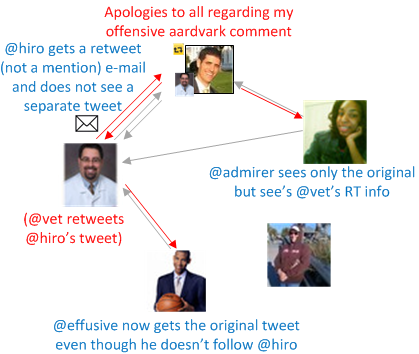 In the example above the guy on the left, @vet, replies to @hiro by prefixing his tweet with "@hiro". However, this probably doesn't work like you think. The tweet obviously shows up in @hiro's timeline, but it also shows up in @admirer's timeline because she follows both people mentioned in the tweet (@hiro and @vet). 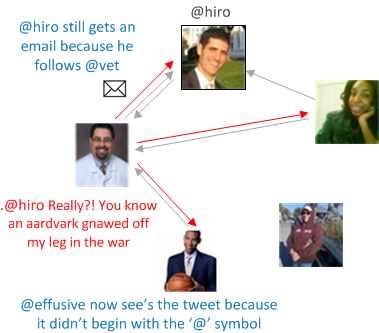 But the tweet does not show up to @effusive because, while he follows @vet, the author of the tweet, he doesn't follow @hiro, the person being mentioned. Getting this scoping rule wrong is way too easy. For instance you can't just announce that someone did something great. 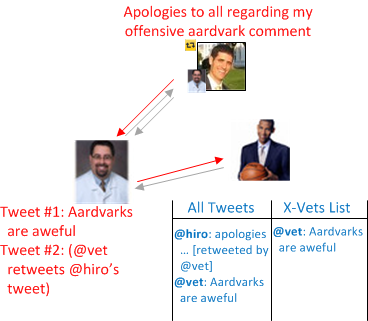 If @hiro started a tweet with "@vet gave a great anti-aardvark presentation" then most of his followers (e.g. @effusive) wouldn't actually see the tweet! I've seen seasoned twitter users make this mistake. As an interesting aside twitter can help track conversations. If you click a reply button in a twitter client or on the website twitter will keep track of which tweet you replied to and then help piece a conversation together. But if you simply start a new tweet with "@somone" without clicking reply, the above scoping rules still apply, but twitter won't help anyone reconstruct the conversation. Finally a word on notifications: If someone mentions you (via a reply or anywhere in their tweet) and you follow them then you will get an e-mail and possibly an SMS notification. If someone that you do not follow replies to you, you will not get an email. For this reason you must either frequently check the "mentions and more" section of the website or use a column based twitter client, discussed in the final section on lists. So what happens if you want to reply to someone, but still have it show up in the timelines of all of your followers? As long as your tweet doesn't start with an "@" symbol then you're fine. So the convention that has grown up is to prefix your tweet with a "." and then the "@someone". In the example above @effusive now sees the tweet where he didn't in a standard reply. #4 Old Style Retweet or "Retweet with Comment"
Prior to late 2009 if you saw a tweet you wanted to share with your followers you would retweet (RT) it by copy and pasting their tweet and prefixing it with "RT @author". The problem from a scoping perspective was that people would get duplicates. In the example above @admirer sees a duplicate from @vet when he retweets @hiro's tweet. There are other problems with old style retweets unrelated to scoping. One problem is that you get long chains of "RT @person1 RT @person2 …". Another problem is it was hard to follow a person but not all their retweets. The biggest problem is old style retweets take valuable characters away from your available 140, and sometimes require mangling the original. Old style retweeting is still in use today primarily from people wish to retweet but add a comment, but also because it allows people to reach a wider audience (since new style retweets won't show up in searches or lists, more on this later). In November of 2009 twitter rolled out a new technique for retweeting aimed at solving the problems mentioned above. It caused a lot of confusion, but did solve the problems. The end result of new style retweets from a scoping perspective is that sometimes people see tweets from people they don't follow. In the example above @effusive sees @hiro's tweet in his timeline even though he doesn't follow @hiro, because @vet performed a new-style retweet. If you click the retweet button on the twitter website today it will perform a new style retweet. Some twitter clients like TweetDeck give you the option. The only way to perform an old style retweet or retweet with comment via the website is to copy and paste the message. Direct messages are simple. Prefix your tweet with "D somone" (no at symbol before the name) and they will be the only person that will see it. Just like e-mail except the recipient will get an e-mail and a text message if they've set that up on their phone. Note that neither people watching an included hashtag (e.g. @spca) nor people mentioned will see direct messages unless they are the recipient. The last scoping topic worthy of mention is lists. This fantastic feature was added by twitter in late 2009. It allows you to organize the people you follow. For instance I have a private "Infrequent Posters" list that I try very hard to never miss a tweet from. Meanwhile I follow enough people that my main list is more like a stream that I dip into but don't get stressed out if I miss some of. Lists work best when used in conjunction with a column based twitter clients (e.g. TweetDeck). These types of twitter clients are the only way to go if you want to become a twitter pro. If you've gotten to the point where you start missing content from important people (e.g. your real life friends), or you're missing responses to your tweets, or mentions from people you don't follow: then you probably need lists, but you absolutely need something like TweetDeck. In regards to scoping, lists contain one subtlety that you need to be aware of. They do not support new style retweets. In the example above @vet posts a normal tweet. He then new-style retweets one of @hiro's tweets. @effusive follows @vet and has also placed him into a list. 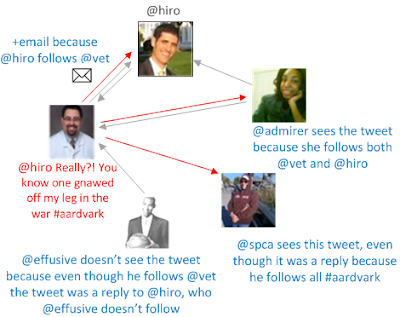 While the list helps @effusive not miss tweets from @vet, it does not end up displaying @hiro's tweet. Note that this rule applies both to people who maintain their own lists as well as to people who follow lists maintained by other people (e.g. your company may maintain a public list of its twitter enabled employees). Twitter may appear to be fairly simple at first glance. In reality it has grown over the years to become very sophisticated. Sophisticated and incredibly powerful. But to fully tap that power you must understand the scoping rules and subtleties surrounding things like replies, retweets, and lists. Hopefully you're closer now.